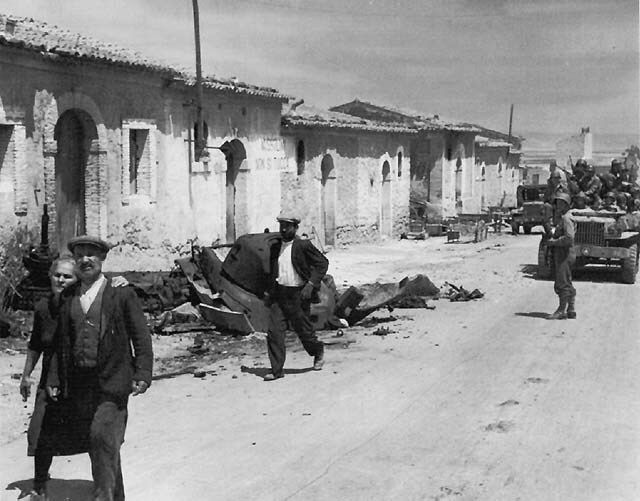 The "Battle of Gela" happened for nearly 4 days from July 10, 1943 when the Allies landed in southeastern Sicily just in front of the small city of Gela. Soon after the landing the Italian Division "Livorno" started a counterattack that was nearly successful in throwing back the invaders in the Gela beach. A group of Italian tanks entered a few hours after the landings inside Gela and were stopped at a few hundred meters from the city's beach. The beaches around Gela were defended by the Italian XVIII Coastal Brigade, the town itself was defended by the Italian 429th Coastal Battalion while the Italian 4th Mountain Infantry Division Livorno, an elite battalion composed by high quality troops with sufficient transports to move all of its infantry units simultaneously, was positioned near Niscemi and supported by the Italian "Mobile Group E" at Ponte Olivo with 38 Fiat 3000 (and some Renault R 35) tanks to respond when invasion points became known. They were considered by the Germans and most Italians to be far superior to the other divisions, as they had originally been intended for the assault on Malta in June, 1942. They were joined on the afternoon of the first day by the German Fallschirm-Panzer Division 1 Hermann Göring with 46 Panzerkampfwagen III and 32 Panzerkampfwagen IV tanks from Caltagirone, reinforced with a regiment of the 15th Panzergrenadiers with the 215th Panzer Battalion attached with 17 Tiger I tanks. The Livorno regrouped and made a further attempt to take Gela back one day later and the 3rd Battalion, 34 Livorno Regiment, is recorded by its Commanding Officer as having made a valiant effort in the Gela Beachhead. But on 15 July, 1943, the Allied armoured units had attacked from west between Valguarnera Caropepe and Raddusa, threatening to encircle the Livorno division. Raddusa was lost by Italians on July 18, 1943 after heavy fighting, and the Livorno division has taken a stand at Simeto river down to the river mouth south of Catania. On July 22, 1943 the Livorno division was subject to heavy coastal bombardment by British ships between Leonforte and the Simeto river mouth, but managed to hold positions. Failures of other Axis units in Sicily then forced a Livorno division to retreat north. At Casa del Priolo, halfway between Piano Lupo and Niscemi, where less than 100 men of the 1st Battalion, 505th Parachute Infantry, had, under Lt. Col. Arthur Gorham, reduced a strongpoint and set up a blocking position, an American soldier saw a column of Italian tanks and infantry heading his way. Alerted, the paratroopers allowed the point of the column, three small vehicles, to enter their lines before opening fire, killing or capturing the occupants. The sound of firing halted the main body. After thirty minutes of hesitation, about two infantry companies shook themselves out into an extended formation and began moving toward the Americans, who waited until the Italians were 200 yards away. Then they opened a withering fire not only of rifles but of the numerous machine guns they had captured when they had taken the strongpoint. Their first fusillade pinned down the enemy troops except for a few in the rear who managed to get back to the main column. The naval gunfire had come in response to a call from observers with the 16th RCT's leading battalions, which were moving toward Piano Lupo. Because the RCT's direct support artillery unit, the 7th Field Artillery Battalion, was not yet in firing position, the destroyer Jeffers answered the call with nineteen salvos from her 5-inch guns.11 A few of the Italian tanks were hit, but the majority were unscathed. No Italian infantry ventured past the Piano Lupo road junction, for they preferred to take cover from the relatively flat trajectory naval fire in previously prepared defensive positions. Masked on the south by high ground that caused most of the naval fire to overshoot the junction, the Italian infantrymen reached and occupied their positions just a few minutes ahead of Gorham's paratroopers. The Italian tanks that passed through the fire, about twenty, continued past the road junction and turned on Highway 115 toward Gela. They proceeded downhill only a short way. The two forward battalions of the 16th RCT, though armed only with standard infantry weapons, knocked out two of the tanks, thoroughly disrupted the Italian thrust, and halted the column. Without infantry support, its artillery under heavy counterbattery fire from American warships, the Italian tankers broke off the fight and retired north into the foothills bordering the Gela plain on the east. Photo of one of the Italian tanks destroyed inside Gela. The 16th RCT reported twenty tanks in this attack. (1st Inf Div G-3 Jnl, entry 17, 10 Jul 43.) The exact number of tanks in this group is not known. One report indicates Mobile Group E had nearly fifty tanks when it started its movement on 10 July (Morison, Sicily-Salerno-Anzio, p. 103). Another report (MS #R-125 (Bauer)) indicates that the Italian unit had one company (twelve to fourteen) of Renault 35 tanks; possibly sixteen 3-ton tanks; and possibly some Fiat "3,000" tanks. The Renault tanks, captured from the French in 1940, weighed two tons and were armed with 37-mm. guns. From reports contained in other American sources, the number of Italian tanks appears to have been between thirty and forty total in both Italian groups. The threat dispersed, the 16th RCT resumed its movement to the Piano Lupo road junction. But Gorham's paratroopers, approaching from the opposite direction, arrived first. After reducing one Italian strongpoint, the paratroopers made contact with scouts from the 16th RCT at 1100.15 The 1st Battalion, 16th Infantry (Lt. Col. Charles L. Denholm), then cleaned out several remaining Italian positions around the road junction, a task facilitated by a captured map, while the 2d Battalion (Lt. Col. Joseph Crawford) and the paratroopers moved across the road and occupied high ground to the northwest. Meanwhile the heterogeneous Ranger-engineer force in Gela had observed a column of thirteen Italian tanks escorted by infantry moving south along Highway 117 toward the city--the right arm of Mobile Group E's two-pronged attack. Another column, the Livorno Division's battalion of infantry, could also be seen moving toward Gela along the Butera road. While the destroyer Shubrick started firing at the tank-infantry column on Highway 117, the Ranger-manned Italian 77-mm. guns opened up on the Livorno battalion. The first Shubrick salvos halted the Italians in some confusion. But the tankers recovered a measure of composure; they resumed their movement, though fewer now, for several tanks were burning in the fields along the highway. Without further loss, nine or ten tanks dashed down the highway and into the city. But the same thing happened here that had happened on the Niscemi-Piano Lupo road--Italian infantrymen did not follow the tanks. And so, in the city, the Rangers and the engineers began a deadly game of hide and seek with the Italian tanks, dodging in and out of buildings, throwing hand grenades and firing rocket launchers. Colonel Darby jumped in a jeep, dashed down to the beach, commandeered a 37-mm. antitank gun, returned with it to the city and knocked out a tank. Another burned as Rangers and engineers teamed up, first to stop it and then to destroy it. After twenty minutes of this kind of fighting, the Italians started back out of the city hotly pursued by American fire. The Italian crews suffered heavily. Almost every survivor carried with him some kind of wound. As for the Livorno Division's battalion--in almost formal, parade ground formation, the Italian infantrymen advanced against the western side of Gela. The two Ranger companies firing their captured Italian artillery pieces took heavy toll among the closely bunched enemy soldiers. Rifles, machine guns, and mortars joined in as the range closed. Not an enemy soldier reached the inner city, only the outskirts. Leaving behind numerous dead and wounded, the remnants of the Italian battalion stopped their advance. Meanwhile the Rangers repelled an attack by a battalion of Italian infantry (an element of the 4th Livorno Division) advancing from the direction of Butera. The enemy soldiers were approaching across open ground in an unusual close-order formation, fully exposed to the American gunners. It was a baffling move by the Italians, who seemed to have a death wish. Every weapon at the Americans’ disposal-captured field guns, the 83rd’s mortars and offshore naval gunnery-rained devastation upon the hapless Italians. As a result, not one enemy soldier reached Gela. 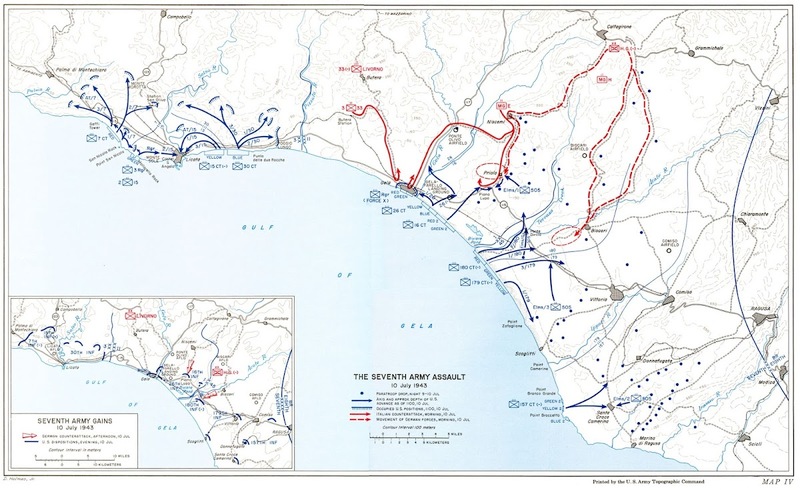 The Italian thrust against Gela stopped, the 26th Combat Team moved from the Gela-Farello landing ground into Gela and made contact with Darby's force by noon. Two battalions swept past the city on the east, cut Highway 117, and took high ground two miles to the north. With the city firmly in American hands, Colonel Bowen, the 26th RCT commander, began to think of seizing the terrain overlooking Ponte Olivo airfield from the west. Yet he was not anxious to start until he had adequate field artillery and armor support. As of noon, Bowen had neither. Nor was the situation along the Piano Lupo-Niscemi axis clear. South of Niscemi, the right column of Conrath's two-pronged counterattack, the tank-heavy force, closed into its assembly area. The infantry-heavy force closed in the Biscari area. With all in readiness at 1400, five hours late, Conrath sent his Hermann Goering Division into its attack. Conrath, the "Hermann Goerin Division" commander, who had received a call from the XVI Corps commander, went to the corps headquarters at Piazza Armerina. He learned for the first time of his attachment to the corps and together with Generale di Divisione Domenico Chirieleison, the Livorno Division commander, also in attendance, he received word of Guzzoni's plan for a co-ordinated attack against Gela. According to the plan, the attack, starting at 0600, would have the German division converging on Gela from the northeast in three columns, the Italian division converging on Gela from the northwest, also in three columns. Northwest of Gela, General Chirieleison commander of the ''Livorno Division" ordered one column to strike at Gela from the north, a second to advance astride the Gela-Butera road and strike Gela from the northwest, the third, while guarding the division right flank against American forces near Licata, to move southeast from Butera Station to Gela. The remnants of the Italian "Mobile Group E" were to support the first column. General Conrath at 0615, 11 July, sent the three task forces of the Hermann Goering Division forward. (Map V) At the same time, one Italian task force, the one nearest Highway 117, jumped off, but on its own initiative, apparently after seeing the German tank battalion start south from Ponte Olivo airfield. To help support the converging attacks on Gela, German and Italian aircraft struck the beaches and the naval vessels lying offshore. The 3d Battalion, 26th Infantry, which had been advancing up the east side of Highway 117, bore the brunt of the German attack. Company K was driven to the south and west toward Gela, but the remainder of the battalion held firm. The Italian column passed the 26th Infantry, bumped into Company K, which was trying to get back to Gela, and headed directly for the city. Colonel Darby's force in Gela laid down heavy fire on the approaching enemy. The 33d Field Artillery Battalion began pounding away at both columns. The two batteries from the 5th Field Artillery Battalion joined in. The 26th Infantry's Cannon Company and the 4.2-inch mortars in Gela also opened fire. The combination of fires stopped the Italians. The bulk of the Livorno Division had by this time joined the Hermann Goering Division attack. General Conrath's two tank battalions were once again united, and though he still contended with the 16th Infantry on Piano Lupo, he decided to send the bulk of his armored force across the Gela plain to the beaches. General Chirieleison, the Livorno Division commander, was also pushing for a concentrated attack that would surge over the American positions. He had already lost one hour waiting for contact with the German unit. He did have one column engaging the Americans in Gela. Now he sent a second from Butera toward the city. With most of the Rangers and engineers heavily engaged against the Italian thrust down Highway 117, only two Ranger companies on the west side of Gela stood in the way of Chirieleison's second column. "You will fight with the troops and supporting weapons you have at this time," Colonel Darby told them. "The units in the eastern sector are all engaged in stopping a tank attack." When the Italian column came within range, the two Ranger companies opened fire with their captured Italian artillery pieces, and with their supporting platoon of 4.2-inch mortars. The Italian movement slowed. General Patton appeared at the Ranger command post in this sector, a two-story building, and watched the Italian attack. As he turned to leave, he called out to Captain Lyle, who commanded the Rangers there, "Kill every one of the goddam bastards." Lyle called on the cruiser Savannah to help, and before long almost 500 devastating rounds of 6-inch shells struck the Italian column. Through the dust and smoke, Italians could be seen staggering as if dazed. Casualties were heavy. The attack stalled. Moving out to finish the task, the Ranger companies captured almost 400 enemy troops. "There were human bodies hanging from the trees," Lyle noted, "and some blown to bits." As it turned out, a large proportion of the officers and more than 50 percent of the Italian soldiers were killed or wounded. East of Gela, as General Conrath sent the major part of both his tank battalions toward the beaches, the Gela plain became a raging inferno of exploding shells, smoke, and fire. The lead tanks reached the highway west of Santa Spina, two thousand yards from the water. As they raked supply dumps and landing craft with fire, the division headquarters reported victory: "pressure by the Hermann Goering Division & Livorno Division [has] forced the enemy to re-embark temporarily." At Sixth Army headquarters, General Guzzoni was elated. After discussion with General von Senger, he instructed XVI Corps to put the revised plan into action: wheel the German division that afternoon to the east toward Vittoria. At 11.00 the Americans retreated inside Gela and Italian troops reached the railway station, while the German tanks reached the beaches south of Gela. The Americans were desperate and started to fear their beachhead lost. Exactly at that hour the headquarters of the VI Italian Army obtained an encrypted message from general Patton ordering to get ready for possible return to ships. But suddenly tanks and troops commanded by colonel Galvin from the south hit the Germans and forced them to stop the winning offensive. The German tanks were hard hit by the navy guns and started to retreat in the early afternoon with heavy losses. But the German tanks never reached the 1st Division beaches. Nor was there any hint of American re-embarkation. The 32d Field Artillery Battalion, coming ashore in Dukws moved directly into firing positions along the edge of the sand dunes and opened direct fire on the mass of German armor to its front. The 16th Infantry Cannon Company, having just been ferried across the Acate River, rushed up to the dune line, took positions, and opened fire. Four of the ten medium tanks of Colonel White's CCB finally got off the soft beach, and, under White's direction, opened fire from the eastern edge of the plain. The 18th Infantry and the 41st Armored Infantry near the Gela-Farello landing ground prepared to add their fires. Engineer shore parties stopped unloading and established a firing line along the dunes. Naval gunfire, for a change, was silent--the opposing forces were too close together for the naval guns to be used. Under the fearful pounding, the German attack came to a halt. Milling around in confusion, the lead tanks were unable to cross the coastal highway. The German tanks pulled back, slowly at first and then increasing their speed as naval guns opened fire and chased them. Sixteen German tanks lay burning on the Gela plain. North of Gela, artillery and naval fire, small arms, machine gun, and mortar fires reduced the Livorno column to company size, and these troops were barely holding on to positions they had quickly dug. The third Italian column, in about battalion size, starting to move from Butera Station to Gela, ran into a combat patrol which had been dispatched by the 3d Division to make contact with the Gela force. The company-size patrol inflicted heavy casualties on the Italians, who pulled back to their original position. The battering received during this attack on Gela finished the Livorno Division as an effective combat unit. Working on a documentary of an LST at the landings. In the log of the ship it records the embarkation orders given which is in support of the following paragraph: General Faldella, the Sixth Army chief of staff, reported (Lo sbarco, page 148) an intercepted Seventh Army radio message that ordered the U.S. 1st Division to prepare for re-embarkation. Faldella repeated this to Mrs. Magna Bauer in Rome during an interview in January 1959, asking repeatedly whether the original message appeared in the official records (that "strangely" disappeared after WWII). Interesting to find supporting documentation.